Looking for a unique way to make your birthday, or that of a loved one, a special memorable day? Think of custom printed Koozies! Add a lighthearted touch with fun birthday favors for your guests! Express Imprint has a wide range of free-to-use templates and clip art to create the perfect design for your birthdays. You can even bring your creativity to life using our online designer tool to create customized Koozies for your birthday. We leave all the designing and customization to you because, after all, you are the one who knows what tickles your guests most. Our designer tool is easy to use and even gives you a preview of the end result of your design before you print it. Birthdays should be nothing short of good laughs, splendor, and plenty of cake. This is why we believe that creating a masterpiece for this special day should be done with creativity and fun! 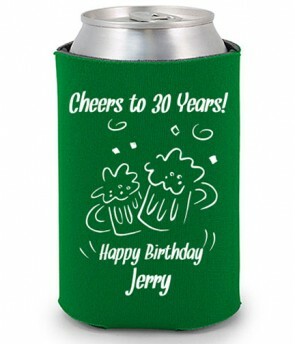 We ensure that every piece used in crafting your birthday Koozies is carefully chosen to reflect the unique theme you have chosen for your birthday! What better way to leave a lasting impression of your memorable day? 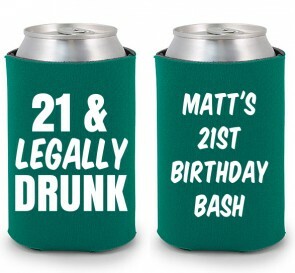 Think outside of the box with personalized custom birthday koozies! Choose from one of our templates to help you get started!